Home / videos / Bypass NOKIA 3 FRP/GOOGLE ACCOUNT LOCK ON ANDROID OREO V8.0.0 LAST UPDATE. 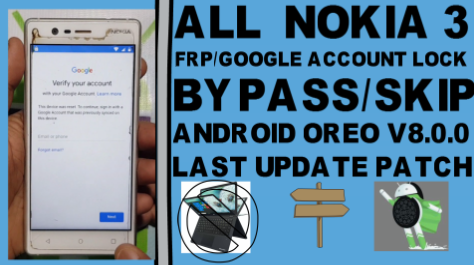 Nokia 3 Frp Lock Bypass Required File. 2# Download 2018 Frp Lock Remove Apk. 3# Download Apex Luncher Apk. Nokia 3 Frp Lock Bypass Method. 3# Go to Vision setting. 5# Screen slid like c.
6# Now go to talkback setting. 7# Disable talkback setting like video. 8# Go help and feedback. 9# Get started with voice access open. 10# Play video click and click clock icon. 11# Now open google crome browser. 13# Go to Google Account Manager v8.0. 14# Download Apex Luncher Apk. 16# Go to Security & location. 17# Open Device admin apps. 18# Disable find my devic. 19# Disable google play servic & Google. 20# Download 2018 Frp Lock Remove Apk. 23# Go to User and account. 24# Logine New gmail id. 25# Enable google play servic. 27# Open your phone on normal mode and connect wifi. 29# Now open your phone. 30# Go to System and about phone. 31# Build namber click 4 time developer option enable. 32# Go to oem unlock enable. 33# Now unstall 2018 frp apk and remove gmail id. 34# Now your nokia phone all model frp remove complite.